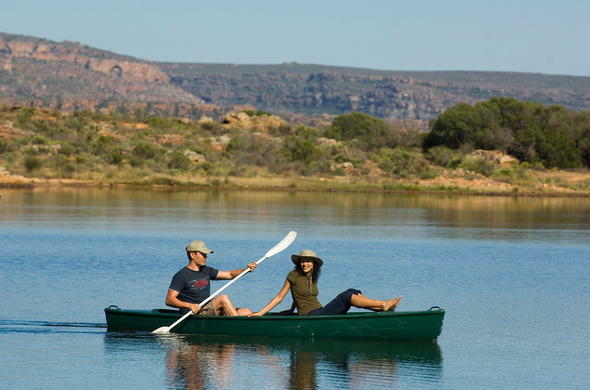 Bushmans Kloof is situated is a malaria free Western Cape nature reserve situated between the Cederberg Mountains and Great Karoo plains. Bushmans Kloof Wilderness Reserve & Retreat is ideally situated between the scenic Cederberg Mountains and the plains of the Great Karoo. This Western Cape nature reserve is home to a diverse range of fauna and flora, including many endangered species. Stay in complete luxury in spacious and elegant rooms at Bushmans Kloof. Choose between luxury rooms, deluxe rooms and elegant suites. Alternatively you can enjoy an exclusive Western Cape nature reserve holiday by staying at Koro Lodge. Koro Lodge is ideal for families. Enjoy soothing spa treatments and wellness escape in nature packages designed to renew a sense of harmony and well-being. Enjoy the spectacular scenery and explore the beautiful surrounding wilderness by foot or enjoy a sunset nature drive. Some of the African wildlife you could spot include Cape Mountain Zebra, Grey Rhebok, Red Hartebeest and Bontebok. Some of the smaller wildlife you could see include Bat-Eared Fox, African Lynx, Aardwolf and 150 different bird species.